Hawk's Nest | THERMO Spoken Here! To observe Harpy Eagles nesting, a naturalist built a blind in a neigboring tree. A line attached to a crossbow arrow was shot through the tree canopy. Next a hook is attached to a stout limb. Finally, by climbing pulley, equipment then the observer are hoisted "H" meters into the tree. (iii) the least work of the man. Note: The man might apply a large force, haul quickly and accelerate the load. Thereafter he might pull slowly. Each manner-of-lifting-effort would have a different associated force for and work for the same actual accomplishment. Our considerations of "equipment-rope-pulley-man" events will treat only slow-frictionless lifts. Such events are called "quasi-static," "quasi-equilibrium" or "reversible." Scenario 1 depicts this lift. (i) Least Force Required: For a very slow, frictionless, "quasi-static" pull of the man, we apply Newton's 2nd Law with the system as the equipment, rope, and tackle: the free body sketch is FBD-1. For the "quasi-equilibrium" lift, the rate of change of momentum is "vanishingly small," so set "left-of-equality" equal to zero. The gravity force of the equipment is mequipgo. Can this be solved? No! Write as components to see. In Eqn-1, the force subscripted "limb" and and that subscripted "pull" cannot be determined. When "unsolvable" is encountered, selection of a "smaller" sub-system of the first system might be a remedy. As sub-system of FBD-1 we choose, simply the lower pulley, FBD-2. Eqns-2 conclude each supporting line tension to equal mequipgo/2. By analysis of the upper (assumed frictionless) pulley we determine the pulling force: Fpull = 300N. 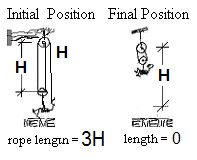 The sketchs (right) (showing "initial" and "final" configurations of the pulley system) make it clear that the man must haul "2H" meters of rope. The least work of this event can be determined by integration of the work definition Eqn-3. We know |Fpull| is constant and we know the length of the pull, Lpull. To understand clearly how the integration must proceed, a new free-boody-diagram (somewhat hard to draw) is needed. FBD-2. shows the man supported by Earth. His hands are wrapped arfound the rope;the small detail shows that the force acting on his fiungers acts upward. The motive of the rope is to lift the man. For calculations a unit vector is defined as erope. This unit vector is always aligned with the rope and directed upward. 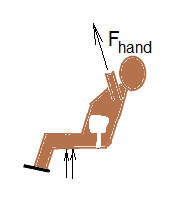 A differential displacement of the mans hands is written: dshands, (part of the surroundings) applies force to the boundary of the system with one hand and pulls it (the rope) downward. His other hand then grasps the rope above and pulls it down. With effort he displaces consequitive parts of the system boundary downward, grabs a next section of boundary, and so on. Second Lift: This lift is an effort whereby the man straps himself into the harness then hand-over-hand hauls himself upward. 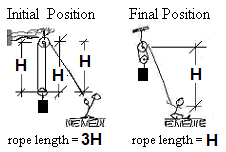 The sketch (right) shows the configuration of ropes and the man for that event. The gravity force acting is mmango. (i) Calculate the force required of the man and the length of rope he must haul. In a manner similar to the hoist of the woman, we see the force must be 300 Newtons and that 90 meters of rope must be hauled.